One of Digital Audio Broadcasting (DAB) advantages over conventional radio is its ability to broadcast visual information in addition to auditory information. This paper presents a study that investigates the effectiveness of delivering visual information using DAB as part of a classroom exercise. The findings from the study demonstrate that some visual materials are better than just auditory information. The study shows that it is important that DAB programme makers consider carefully the types of visual information used and the amount of visual information broadcast. In the 1980's a new digital transmission system for sound broadcasting, Digital Audio Broadcasting or DAB, was developed by the EUREKA-147 consortium and this was adopted as a European standard in 1992 (ETS300 401, 1992). DAB can offer transmission rates of up to 1.5Mbits/second for data of any kind. It is therefore possible to transmit visual as well as audio data in parallel. This flexibility offered by DAB radio has many advantages over existing FM broadcasting. Not only it can provide better sound quality and make more efficient use of the radio spectrum, but it can also carry visual messages in parallel with the radio transmissions. Viewed by many in the broadcasting industry as the next generation of radio services (Duncumb et al, 2003), DAB is also considerably less expensive than TV and can out-perform mobile and Internet methods of communication when broadcasting information to very large groups of people simultaneously. It, therefore, has potential for the economical transmission of educational material. We examine how effective a DAB programme can be in an educational setting when different combinations of media are used to present the contents. Our intention is to determine whether the use of visual materials within DAB programmes is worthwhile and, if so, what types of visual material should be considered or rejected. 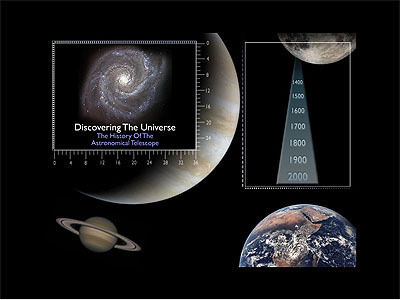 Working with Nucleus Digital, a comany designing modules for teaching basic Astronomy to students, we decided to create four versions of a DAB programme for Astronomy. Version 1 was audio only and represented a conventional radio programme. It provided a control group from which to compare the effectiveness of the other three versions. Version 2 consisted of audio, a timeline and diagrams. Version 3 consisted of the audio and the timeline only, and Version 4 consisted of the audio and diagrams alone. We also created a "browsable" version which contained all the material. Our methodology is illustrated in Figure 1a. The students were divided into four groups and each group was shown a different version. They were then tested to determine the knowledge gained during the presentation. One hour later, the four groups were given access to the browsable version and asked to browse for about 15 minutes. Then they were tested again for the knowledge gained. 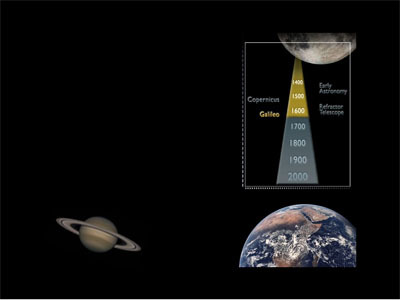 Examples of the different versions can be viewed in Figures 1b-1e. All versions ran for the same duration and delivered the same audio track underpinned by the same key messages. The experiment was carried out within a module on Multimedia at Loughborough University. The module formed part of a course on Human Computer Interaction taught within the Department of Computer Science. From a teaching perspective, the experiment aimed to illustrate to students the effects that different media combinations might have on learning performance. All students taking the module were asking if they would like to take part in the study and those who agreed were divided into the four groups, which were carefully balanced for gender, age and knowledge differences. The presentations for each group took place in separate lecture rooms. When all the participants in a group finished they were allowed to leave. Figure 1a. Methodology used in study. Figure 1b. 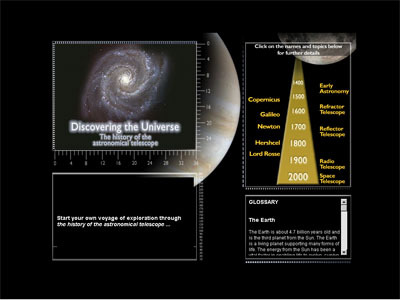 The screenshot shows the title, credits and timeline at start of the astronomy programme. Figure 1c. The screenshot shows an example of the contents given to learners who were within the group presented with audio and timeline (Group 3). Figure 1d. The screenshot shows an example of the contents given to learners who were within the group presented with audio and diagrams (Group 4). Figure 1e. the screenshot shows the browsing feature once the astronomy programme has finished. A glossary of terms is given and the timeline become active to allow learners to revisit parts of the programme. Spoken information within the programme is displayed as text in the browsing section. An hour after the presentations, all groups reconvened in a computer laboratory. They were then given 15 minutes to browse through an interactive version of the programme containing all the textual and visual information. Following this session, each participant was given a second test. 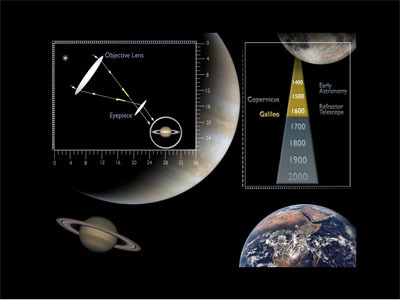 Examples illustrating some of the contents within the programme such as animations (Figure 2) and photographs (Figure 3) are given below. Figure 2. 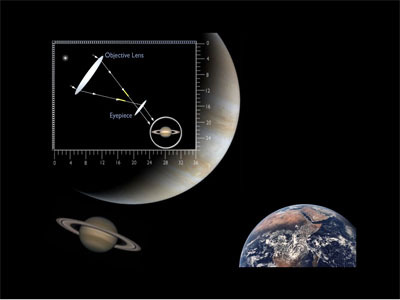 The screenshot gives an example during the astronomy programme of an animation of how a telescope works. It shows how light passes through the Objective Lens, becomes inverted and then passes through the eyepiece. Figure 3. 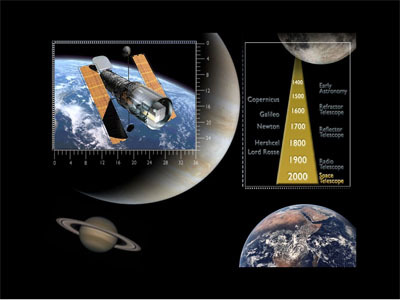 The screenshot shows a picture of the space telescope Hubble towards the end of the astronomy programme. In the DAB programme, the visual verbal and visual nonverbal information within the diagrams and timeline were integrated to limit the occurrence of split attention effect. This effect occurs when text and diagrams are placed in separate sections of the written page. The visual text and nonverbal information were synchronised with the auditory verbal and nonverbal information. In the presentations where visual information was not shown, a dark mask was placed over the screen area. For the browsable version, the masks covering the two textual areas in versions 1-4 of the DAB programme were removed to allow participants to browse the information. Sound was also removed so as not to inhibit participants when they were reading the textual information. In the browsable version, all the interaction centred on the timeline. Selecting labelled parts of the timeline redisplayed the visual nonverbal information and displayed, in a text field, what was originally spoken. We also provided a glossary of terms used in the programme and made this available for reference in the browsable version. Further details about the programme have been reported by Duncumb et al (2003). Pre- and post- tests were used in the study. The pre-test assessed the participants' prior knowledge of the subject area (whether they already knew any of the material covered in the programme). The test consisted of 13 open-ended questions about the contents of the programme. Each question had four columns which participants selected to illustrate the degree of their prior knowledge. For example, participants could select the 'already knew the answer fully before seeing the material' column, if they were fully conversant with the presented material. Other options that could be selected were -- 'had met the material before and the programme reminded them of it', 'vaguely remember something before but relied on the programme to answer' , or 'had not met the concept at all before' . Participants were expected to respond to each question by placing a tick in one of the columns. The post-test contained the same questions about the material in the programme as the pre-test. However, they were phrased in a different way so that they addressed the issue of whether participants had recalled prior knowledge of the materials from the first viewing of the programme or during the browsing exercise. All the questions were based upon the auditory information delivered. The second test was based on the first to allow for comparisons between seeing the programme and browsing the interactive version. Forty-nine participants (out of a possible 100 students) took part in the experiment. The number of participants in each group were: 14 in Group 1, 13 in Group 2, 10 in Group 3 and 12 in Group 4. Figures 4a-4f show the results from the experiment across each media group. Figure 4a shows the mean test scores for the pre- and post- tests across each media group. Beside each mean test score for each media group is an additional set of scores that take into consideration prior knowledge. The difference between the mean test scores and those adjusted for prior knowledge in both tests is not significant. This suggests that at the start of the experiment the participants had little or no prior knowledge of the material covered in the Astronomy programme. In the pre-test, the mean scores between the media groups were significantly different (p=0.006). This was also the case between the media groups in the post-test (p=0.022). In test one the group of participants given Audio and Diagrams obtained the highest average score, followed by the group given Audio and all visuals. The group of participants given Audio and Timeline obtained the lowest mean score. Figure 4. Results from the experiment across media groups. Figure 4a. Prior knowledge scores. Figure 4b. Improvement in scores. Figure 4d. Browsable version interesting. Figure 4e. Learnt from presentation. Figure 4f. Learnt from browsable version. In the post-test, the mean scores between the media groups were similar, in that the group given Audio and Diagrams obtained the highest mean score and the group given Audio and Timeline obtained the lowest mean score. Interestingly, in Test Two the group given Audio only obtained a higher mean score than those given Audio and all visual. All the participants who completed both tests obtained higher scores in the second test than the first. Figure 4b shows the difference in the improvement participants made in the mean scores across each media group. There was no significant difference in participants' improvement across media groups. Interestingly, the group who were given Audio Only improved the most between test one and two. In contrast, the group who were given Audio and Diagrams improved the least in the post-test. In spite of there being no significant difference in improvement across the media groups overall, there was a significant difference between the groups given Audio only and the group given Audio and Diagrams (p=0.023). From the results of the pre-test, 50% of participants given Audio Only felt that the programme was easy to follow. In contrast, where Audio and all visuals were given, 92.3% felt that the programme was easy to follow. 50% of the participants given Audio and Timeline and 66.6% of those given Audio and Diagrams also felt the programme was easy to follow. In the post-test, the group who were originally given Audio only seemed to find the programme easiest to follow. This is contrary to what we would have expected -- that those who were originally given Audio and all visual would find the programme the easiest. Figures 4c-4f show participants' subjective views about how interesting the programme was to follow, and how much they felt they had learned from the programme. Founded on the results of Test One, Figure 4c shows that 64.2% of participants given Audio Only felt that the programme was interesting compared with 84.6% who were given Audio and all visuals, 80% who were given Audio and Timeline, and 91.6% who were given Audio and Diagrams. In this case, the programme containing Audio and Diagrams was found to be more interesting by participants. In terms of the results from the post-test (shown in Figure 4d) all of the participants given Audio only, 61.5% of those who were given Audio and all visual, 80% of those who were given Audio and Timeline, and 83.3% of those who were given Audio and Diagrams felt that the programme was interesting. Clearly the post-test programme containing Audio only was seen to be the most interesting. Derived from the results of Test One, Figure 4e shows that 71.4% of those participants who were given Audio only and 80% of those who were given Audio and Timeline felt they had learned little or nothing from the Astronomy programme. In contrast, 61.5% of those who were given Audio and all visuals and 58.3% of those who were given Audio and Diagrams felt they had learned something from the programme. In terms of Test Two (shown in Figure 4f) 42.8% of the participants who were given Audio only and 40% of those who were given Audio and Timeline felt that they had learned little or nothing from the programme. In common with the results for Test One, 61.5% of the participants who were given Audio and all visual and 75% of those who were given Audio and Diagrams felt that they had learned something from the programme. The participants who were given Audio and Diagrams achieved better scores. In contrast, the participants who were given Audio only felt they had learned more by the end of the experiment. We were pleasantly surprised both by the effectiveness of the DAB presentations and the ease with which they were created. Large numbers of students could be educated in this way in a cost effective manner. Although necessarily, DAB cannot transmit some complex media as effectively as television, this limitation was not evident either in the quality of the presentations or in student comments when using them. In theory, DAB could be used to reach a really large audience. However, one difficulty which still needs to be explored is the effect of many different DAB receivers in the marketplace. While some have very limited visual presentation capabilities, others can provide full multimedia capabilities. More research is needed to determine how the same presentation might be received on receivers with variable capabilities. Another interesting question is how can one prepare one presentation capable of being successfully transmitted to a large range of receivers without having to provide multiple versions. Finally, we must not forget that radio is an important resource for visually challenged students and alternative presentations will need to be produced for such students. Different media combinations used to represent information within a DAB programme can have an effect on the learning performance of individuals. Including visual information within DAB programmes can help improve learning performance. Including many different types of visual information can inhibit learning performance. Browsing after the programme presentation can help, but may not allow individuals to catch up with those who experienced the most effective combination of media. The study has shown that great care needs to be taken in selecting appropriate media used in DAB educational programmes. Time needs to be allowed for visual materials to be broadcast before the audio so that information regarding the entire programme is delivered correctly. In the case of using video, often the same key messages can be communicated using a more appropriate combination of media. An important research area is an examination of the potential for broadcasting different versions of the DAB educational programme at the same time. The receiving device will then select the most appropriate media for display. For example, people with conventional DAB radios will only hear the audio information. People with DAB receivers connected to their computer will view an entire animated presentation. Alternatively, selected parts of the presentation might be displayed in the form of a slide show to people who have DAB devices with a small liquid crystal display. This provides a range of accessible alternatives in real-time. With regards to students, e-learning approaches often fail to recognize the advantages of learning together in groups. Using DAB to deliver distance educational programmes does not limit the size or the geographical area of a group. The DAB educational programmes can also be simultaneously stored by students and used later with other students for reference, discussion, revision and support. This study shows that incorporating visual materials within radio programmes can enhance educational effectiveness. DAB allows educational materials to be broadcast to an entire population at the same time without incurring the overload problems of the Internet and the costs incurred in producing TV programmes. By choosing and integrating the most appropriate media, we improve learning results. This is particularly important to educators who are restricted by the amount of bandwidth available. Based upon our findings, DAB can deliver educational materials to large numbers of students, simultaneously, over a large geographical area. Its true potential is only likely to be fully exploited once personal hand-held devices integrating mobile and DAB communications are widely available. In regard to people with disabilities, currently many visual impaired people receive education and entertainment through radio. While DAB has the potential to help people with some types of disability, it can inhibit learning for the visually impaired, especially when information, such as the time, is delivered visually, rather than in auditory. This can have important implications for those visually impaired people who listen to DAB radio. It has been argued that, since DAB possesses a lower amount of bandwidth than other forms of communication, the combination of media used to represent information is important. This paper has shown that different media combinations can have a significant effect on learning performance of students who were given a DAB educational programme and that by carefully designing these programmes, we can improve students' learning performance and compensate for reductions in the amount of bandwidth available. Using visual material in radio can significantly improve learning performance, but we have been unable to ascertain precisely the optimum level of bandwidth needed to ensure that the audio information is effectively communicated. Plans for future research will address this issue. Alty, J.L. (1999). Multimedia and Process Control Interfaces: Signals or Noise? Trans. Institute of Measurement and Control, Vol. 21, No. 4/5, pp 181 - 190. Alty, J.L. (2002). Dual Coding Theory and Education: Some Media Experiments to Examine the Effects of Different Media on Learning, In the proceedings of ED-MEDIA 2002: World conference on educational multimedia, hypermedia & telecommunications, June 24-29, 2002, Denver, Colorado, USA. 42-47. Beacham, N.A. and Alty, J.L. (2003). The MEDIA Project: , In the proceedings of ED-MEDIA 2003: World conference on educational multimedia, hypermedia & telecommunications, June 23-28, 2003, Honolulu, Hawaii, USA. 2689-2695, (Received outstanding paper award). ETS 300 401 (1992), Radio Broadcast Systems; Digital Audio Broadcasting (DAB) to mobile portable and fixed receivers. Cobb, T. (1997). Cognitive efficiency: Toward a revised theory of media. Educational Technology Research & Development, 45 (4), 21-35. Duncumb, I.P., Gadd, P.F., Wu, G. and Alty, J.L. (2003). Visual Radio: Should we paint pictures with words or pictures? In the proceedings of the IBC 2003 Conference, International Broadcasting Convention, 11-15 September 2003, Rai Convention Centre, Amsterdam. Mayer, R.E. (2001). Multimedia Learning, Cambridge University Press, ISBN 0521-78239-2. Najjar, L.J. (1996). Multimedia information and learning, Journal of Educational Multimedia and Hypermedia, 5(1), 129-150. Paivio, A. (1971). Imagery and verbal processes, New York: Holt, Rinehart & Winston. Sweller, J., van Merrienboer, J. J.G. and Paas, F.G.W.C. (1998). Cognitive Architecture and Instructional Design, Educational Psychology Review, 10(3), 251-296.